To Cite: Heidaranlu E, Khankeh H, Ebadi A, Ardalan A. An Evaluation of Non-Structural Vulnerabilities of Hospitals Involved in the 2012 East Azerbaijan Earthquake, Trauma Mon. 2017 ; 22(2):e28590. doi: 10.5812/traumamon.28590. Background: When disasters strike, hospitals are among the first units whose efficient and timely services can be crucial and decisive in reducing mortality and rescuing the injured. Non-structural components are among domains that need to be considered in any assessment of hospital readiness. Objectives: Given that Azerbaijan, and especially the metropolis of Tabriz, is located in the world’s earthquake belt, this study aimed to evaluate the non-structural vulnerability of hospitals involved in the 2012 Azerbaijan earthquake. Materials and Methods: In a cross-sectional study, eight public, social security, military, and private earthquake-stricken hospitals in Azerbaijan were assessed from nine different aspects using the standard checklist issued by the WHO/HSI (hospital safety index). Results: The lowest level of performance was observed in communication and electrical systems. The hospitals surveyed had appropriate levels of performance in terms of water supply systems, medical gas systems, and emergency fuel. Although in the overall assessment, approximately 60% of hospitals surveyed had an acceptable performance in their non-structural elements, key sectors such as emergency, ICU, radiology, and laboratories had rather low to moderate levels of safety in all hospitals. Conclusions: Overall, two hospitals had high levels of readiness in the assessment (above 80%). Given that Iran, and particularly its neighbor Azerbaijan, is a crisis-prone country, adherence to non-structural security protocols of the WHO has had a significant effect on the non-structural readiness and safety of hospitals. When a disaster strikes a community, all economic, political, and cultural infrastructures are threatened in that community. All equipment and facilities available in the community should be mobilized to respond to disasters. The world health organization (WHO) declared 2009 as the "year of health" in the disaster assessment field (1, 2). While Iran has only 1% of the world’s population, more than 6% of casualties caused by natural disasters in the world are related to this country (3). According to a 2009 report on disaster risk reduction, the risk of natural disasters in Iran was estimated to be 8 out of 10, based on the deaths of about 106,000 people during the past four decades (4). In short, the healthcare sector plays an active part in disaster management, and is an integral part of the national health program and the promotion of public health. When disasters strike, hospitals are among the first units whose efficient and timely services can be crucial and decisive in reducing fatalities and rescuing the injured (5). In the event of a disaster, healthcare systems are expected to assume a key role in reducing mortality and damages, and hospitals are considered important components of the healthcare system in this regard. The WHO always emphasizes three components for hospital readiness during disasters: structural, non-structural, and functional (6). The hospital safety index (HSI), a product of the pan American health organization (PAHO) and disaster mitigation advisory group (DiMAG), is one of the WHO’s guidelines for hospital safety. The HSI was designed to assist hospitals in evaluating safety, prioritizing planning, and preventing damage to the healthcare centers due to accidents and disasters. In Iran, the HSI was translated by Ardalan et al. and localized as the Farsi hospital safety index (FHSI) (7). The non-structural parts of a building include all parts of the building and its contents, with the exception of the structure (8). In other words, everything except the columns, floors, beams and so on (9). Common non-structural components include: ceilings; windows; office equipment; computers; inventory; filing cabinets; water tanks; generators; transformers; heating, ventilating, and air conditioning (HVAC) equipment; electrical equipment; furnishings; lights; and so on (10). Previous studies have shown that only 15% of hospital costs are devoted to structural elements, and 85% of costs are funnels to architectural, mechanical and electrical components, and storage tanks and other special equipment for hospitals (11). The Kobe earthquake (1995) and the Japan tsunami (2011) showed what can happen in a disaster; many hospitals saw the fall of shelves, the movement of wheeled and non-wheeled devices, and the destruction of treatment and administrative offices and non-fixed laboratory equipment. Heavy medical equipment, such as MRIs, radiology devices, and tomography equipment were displaced. Severe damage was also observed in operating room equipment, CatLabs, and there was secondary damage to other pieces of equipment (12, 13). Azerbaijan is located northwest of Iran. Given that Azerbaijan, and especially the nearby metropolis of Tabriz, are located in the world’s earthquake belt, earthquakes are one of the events tied to its history (14). A relative comparison of the risk of earthquake in different parts of the region shows that Azerbaijan is located in an area with peak ground acceleration (PGA) (15). Tabriz’s north fault is one of the most dangerous faults in Iran; it is three kilometers away from Tabriz, but now the area is home to one of the most densely populated of the city’s neighborhoods. This fault is active now, and the occurrence of large earthquakes in the unknown future is an undeniable fact (14, 16). On August 11, 2012, two earthquakes of 6.4 and 6.3 magnitude occurred in East Azerbaijan, in the Varzaghan area about 50 km northeast of Tabriz. This earthquake left 306 dead and damages totaling more than 8000 billion Iranian rials; the earthquake caused irreparable damage to this region (17). Hospitals in Harris and Varzaghan, the nearest treatment centers providing services to earthquake victims, were severely damaged and practically useless, therefore victims were transported to Tabriz hospitals (18). Despite the high risk of earthquakes and experts’ warnings in this regard, no substantive measures have been taken to improve readiness and reduce the number of possible future casualties in this area (19). As an earthquake-prone area, along with the increasing urban population, one cannot understate the importance of readiness planning for health centers, which will serve as the most influential centers in the event of disasters (20). The need to pay attention to this issue led the researchers to conduct a study in this regard. This study aimed to evaluate the non-structural vulnerabilities of hospitals involved in the 2012 east Azerbaijan earthquake, in Tabriz, Iran. This was a cross-sectional study. At the time of our study, Tabriz had 22 public and private hospitals, but only eight hospitals had admitted earthquake victims. All eight hospitals involved in the earthquake were enrolled in the study. The characteristics of our selected hospitals included: public and private affiliation, of bed numbers between 60 and 980, and staffing numbers between 205 to 1910. The study sample included eight hospitals, which were studied in 9 domains. To respect ethical principles in this study, the eight hospitals were labeled by letter, as A, B, C, and so on. The WHO standard checklist (i.e., his) was used to evaluate the hospitals’ non-structural performance. Validity and reliability of the study tool was repeatedly confirmed in previous studies at home and abroad (4, 5, 7, 21, 22). Data collection was conducted between September and October 2012. The checklist has nine separate domains in the non-structural area: electrical systems; telecommunications systems; fuel storage; medical gases; water supply; heating, ventilation, and air-conditioning (HVAC) systems; office and storeroom furnishings and equipment; medical and laboratory equipment and supplies; and architectural elements. In this study, according to the HSI, low, moderate, and severe safety levels were assigned the marks 1, 2, and 3, respectively. Eight items were evaluated in electrical systems, four items in fuel storage, seven items in telecommunications systems, five items in water supply, seven items in medical gases, seven items in heating, ventilation, and air-conditioning (HVAC) systems, three items in office and storeroom furnishings and equipment, 12 items in medical and laboratory equipment and supplies, and 18 items in architectural elements. The minimum safety level was given a score of 1, and the maximum safety level was given a score of 3. According to the HSI, two-thirds of the possible maximum score in each area was considered appropriate (7). Data were entered into Excel and numerical values were extracted. Results non-structural vulnerability was evaluated in nine domains and compared among eight hospitals (Table 1). aFixed and movable including computers, printers, etc. bUsed for diagnosis and treatment. 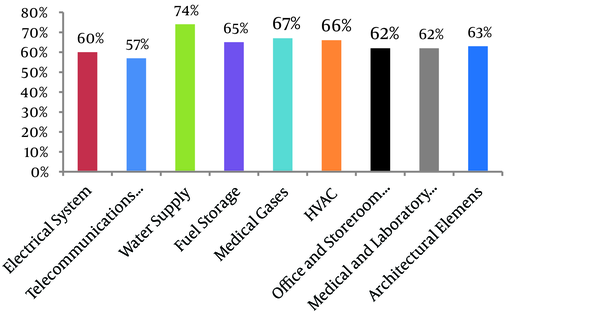 As the Table 1 indicates, the hospitals surveyed had the highest readiness in their water supply systems (seven out of eight hospitals) and medical gas storage (five out of eight hospitals) (Figure 1). They had the lowest readiness in communication and electrical systems. In the overall assessment, hospitals B and F had the lowest readiness, and hospitals A and E had the highest non-structural readiness. Other hospitals had 50% to 70% non-structural readiness for dealing with disasters. In this study, over 50% of hospitals surveyed had appropriate readiness in terms of their non-structural components. The study by Zaboli et al. (22) showed that, generally, the vulnerability of the hospitals surveyed was moderate in terms of non-structural readiness. The study of Hosseini Shokouh (23) in evaluating the readiness of Iran university’s hospitals during an earthquake suggested that 47% of hospitals surveyed had moderate readiness, and 14% had low readiness regarding the safety of equipment and hazardous materials after an earthquake. As can be seen, the results of our study are consistent with other studies that investigated non-structural readiness of hospitals, confirming that this performance is at an acceptable level during earthquake. The non-structural elements of a hospital are like the links of a chain; the weakness of each link may lead to the breakage of the entire complex (21). Therefore, the mean values of the non-structural safety levels of a hospital cannot practically be a good indicator per se of the vulnerability of hospitals. So, investigating each of the non-structural domains and predicting strategies to improve their performance will be closer to reality. In one California earthquake (1994), which led to the evacuation of 14 hospitals, power cuts were the main causes of evacuation (24). Investigating the non-structural vulnerability of hospitals involved in the Azerbaijan earthquake showed that 40% of hospitals had inappropriate electrical systems (Figure 1). We evaluated how many seconds it would take for the generators to start working after a power cut to supply the power needed for the hospital. We investigated the vulnerability of the generators to see whether they were properly protected against a variety of risks. We also carefully investigated how generators were fueled. In addition, the emergency lighting systems should include rechargeable (battery-operated) generators, so the emergency evacuation process would have no casualties. Further, emergency power should be anticipated for vital parts of the hospital at the time of an earthquake. In this study, communication systems were not appropriate in 43% of hospitals surveyed; 37% of hospitals had the lowest score for non-structural readiness in this respect (Figure 1). In the study by Maher (2014) on non-structural readiness of selected hospitals in Tehran, only 29% of hospitals surveyed had readiness in their communication systems (12). Since information is the most important element in crisis management, it is clear that the admission of the injured is very much related to external communications and internal coordination (25). In this domain, evaluators checked antennas and lightning rods, cable connections, alternative communication systems (mobile phones, satellite phones, the internet, and loudspeakers), computer network servers, and loudspeakers for internal communication systems. In this regard, strengthening and fixing equipment and the cabling in hospital communication systems, and developing multiple communication layers, can guarantee communications during disasters. Half (50%) of the hospitals surveyed had low and inappropriate safety levels for their emergency fuel tanks (Figure 1). The evaluators placed the most emphasis on the following points: having fuel storage tanks that will last for at least five days, ensuring fuel tanks are strong and receive standard protection, observing safe distances (from electrical installations, boilers, kitchens, and other fire-prone areas) and the safety of the fuel distribution system (valves, pipes, and fittings). Currently, most hospitals are supplied with natural gas, a feature that will make ensuring the hospital’s continued energy supply difficult in critical conditions. In this regard, providing hybrid engines would be useful. Achour et al. (2011) studied the effects of structural and non-structural readiness of earthquake-stricken hospitals in 34 treatment centers in Sichuan, China. The study showed that the hospitals surveyed had no appropriate anchors and fixing systems for the non-structural aspects of their fuel tanks. In addition, the study emphasized the installation of flexible connections for pipes at their junctions to tanks, so they may be able to withstand adverse seismic conditions (26). Among the hospitals in our study, 74% had appropriate safety levels for their water supply systems (Figure 1). Although most hospitals are normally equipped with emergency water supply systems, these systems are often designed for normal conditions and cannot respond during disasters. We place the most emphasis on having a permanent storage capacity for 72 hours, based on at least 300 liters per day per bed, implementing standard protections for the storage tanks, using flexible connections, and having a supplementary water pump system (at least two pumps). In total, 67% of the hospitals surveyed had appropriate safety levels for their medical gases (Figure 1). Using seismic gas shutoff valves for the central oxygen system would prevent gas leaks and the consequences of their spread during disasters (27). The highest focus of evaluators in this area was on securing a sufficient supply of medical gases for at least 15 days; strengthening medical gas tanks, cylinders and related equipment; ensuring alternative sources; appropriate places to store medical gases; and the safety of the distribution system. Approximately 50% of the hospitals surveyed had appropriate safety levels for their heating-cooling and ventilation systems (Figure 1). These systems are composed of several components that are different in each hospital. The evaluators checked cases such as the use of appropriate anchors for channels and flexible channels, pipes, strong air conditioning equipment, and HVAC system performance. Heating-cooling and ventilation systems are expected to be disturbed during a crisis. All equipment of these systems should be fully braced, and flexible connections that can withstand adverse seismic conditions should be used at the junctions of pipes and cables to equipment. About 25% of the hospitals surveyed had no appropriate safety level for their office furniture and equipment. Established procedures, such as braces, screw clamps, putting locks on closets, and the strapping of cabinets and computer equipment were appropriate in 75% of the hospitals surveyed (Figure 1). As for the safety level of medical and laboratory equipment, first, evaluators examined the performance of devices and equipment, and then they checked their fasteners and anchors. In the operating and recovery rooms, the team emphasized lights mounted on the ceilings of the operating rooms and that beds in the operating rooms should be completely fixed. Only 12% of the hospitals in our study had unacceptable conditions in terms of medical and laboratory equipment systems (Figure 1). In this regard, the safety of the radiology, laboratory, and emergency department equipment; ICU; CCU; pharmacy; sterile units; neonatal; and burn wards were carefully examined. Sabzghabaie (2013), in a study entitled hospital safety in hospitals affiliated with Shahid Beheshti University of Medical Sciences and conducted between 2011 and 2013, showed that 71% of the hospitals surveyed had problems in terms of fixing cabinets and their safety, the brakes of wheeled equipment in radiology and laboratory departments, and did not have an acceptable performance (28). Of the hospitals surveyed in the present study, 63% had appropriate safety levels for their architectural components (Figure 1). Although these components may not have a direct effect on a hospital’s performance, when they are destroyed during an earthquake, they will certainly cause a serious disturbance in the performance of the hospital wards. The research team mostly focused on observing HSI guidelines, such as the safety and status of doors and entrances, windows, building-covering components such as external walls and facades, roofs, fences, partitions and interior walls, traffic outside the building to facilitate access for ambulances, the fire protection system, emergency signs, and emergency exits. During the Azerbaijan earthquake, the most prepared hospitals were hospital A, with 87%, and hospital E, with 84%, non-structural readiness, respectively (Table 1). In this study, no relationship was found between the size of a hospital and its non-structural readiness. Considering that hospitals are the first line of disaster response, and preparedness is the first loop in cycle of disaster management, the results of our study showed that the hospitals under study do not have an adequate level of readiness to confront disasters. In general, the hospitals surveyed showed a relative degree of readiness in the domains of non-structural safety in each of the related items. Since a weak link in the readiness chain will disturb other links during a crisis, readiness in one or more aspects, and unreadiness in other non-structural aspects, generally shows that a hospital’s readiness level is inappropriate. The HSI outlines extensive engineering methods and guidelines for hospital readiness in non-structural aspects. Hospital performance, according to this protocol, will certainly have a significant effect on structural and non-structural readiness. It is recommended that future studies define the scientific concept of “non-structural safety” and that research be designed to develop national and even international tools based on the definition obtained. This article is a part of a PhD dissertation presented to the Faculty of nursing, Baqiyatallah University of Medical Sciences. Hereby, we greatly appreciate the cooperation and assistance provided by the health management research center, Baqiyatallah University of Medical Science, for its financial support and the authorities and hospital staff in involved in the 2012 Azerbaijan earthquake. Authors’ Contribution: All authors were involved in all stages of the research. Esmail Heidaranlu was active in the formulation and implementation phases of the study. Abbas Ebadi was scientific and Statistics adviser in this study. Hamidreza khankeh was scientific adviser in this study. Ali Ardalan was scientific adviser in this study. Funding/Support: This research received funding from two centers: the nursing faculty and management research center at Baqiyatallah University of Medical Sciences, Tehran, Iran.